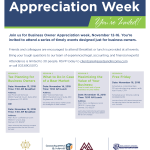 Join Jeff Krommendyk, Security First Insurance Agency; Karl Frank, CFP®, AIF®, MBA, MSF, A&I Financial Services LLC; Nathan Merrill, Goodspeed & Merrill; and Mike Miller CPA, Miller & Associates CPAs LLC for Business Owners Appreciation Week. There have been many changes to the tax code over the last year, join us to learn more about how the changes will impact you. Friends and colleagues are encouraged to attend. Breakfast or lunch is provided at all events. Bring your tough questions to our team of experienced legal, accounting, and financial experts! Attendance is limited to 30 people for each session. 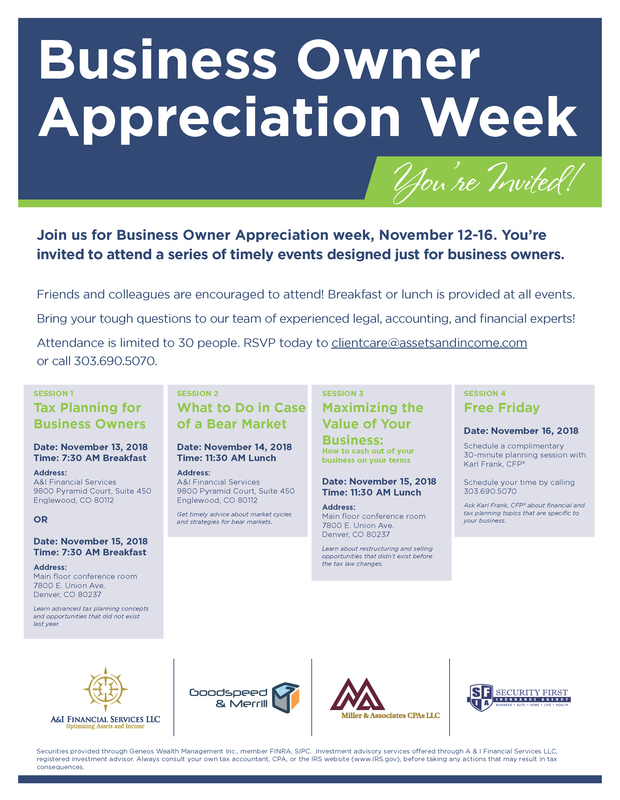 RSVP today to clientcare@assetsandincome.com or call 303.690.5070. Learn advanced tax planning concepts and opportunities that did not exist last year. Get timely advice about market cycles and strategies for bear markets. Learn about restructuring and selling opportunities that didn’t exist before the tax law changes.